Not to forget that also at Mid-Continent the privately owned 1912 Baldwin 2-8-2 Saginaw Timber No. 2 is now complete and has its FRA ticket. Testing, break-in and crew training are on the schedule for 2016. Also not to be left out is the amazing accomplishment in Maine on the WW&F Rwy. with their multi-year refurbishment of WW&F Locomotive No. 9. 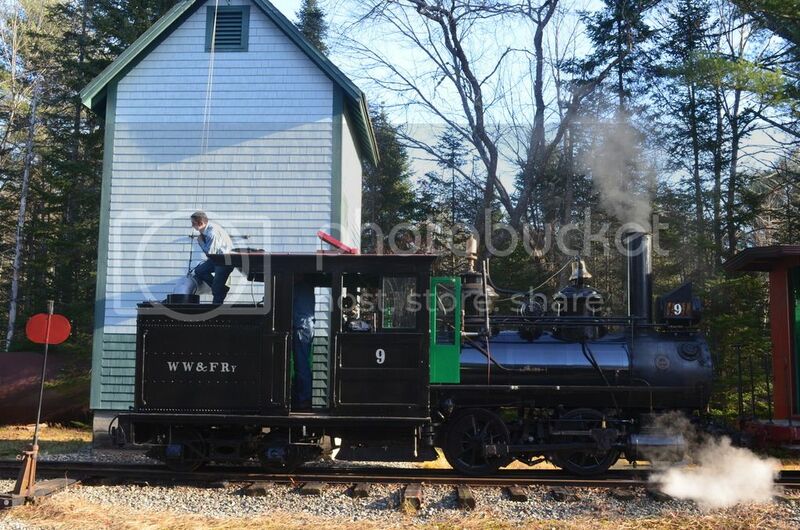 This is a Smithsonian-quality restoration of a GENUINE Maine two-foot gauge steam locomotive. Last edited by LVRR2095 on Mon Dec 14, 2015 10:15 am, edited 1 time in total. 611, 4501, and 4449 back in steam. Serious progress made on 1309. Watering up for a test train yesterday. It will be operating for our Victorian Christmas on Saturday Dec 19. 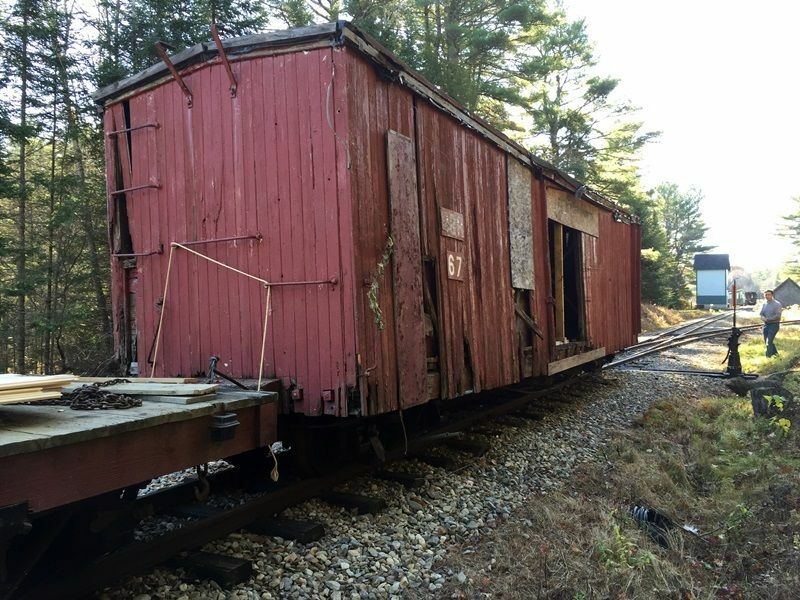 [*] We helped to save a Bridgton & Saco River RR boxcar from scraping. Car 67 now resides in the car shop ready to be rebuilt, should funds become available. At the Western Railway Museum, Portland Traction 4001 made its public debut after a four-year restoration. 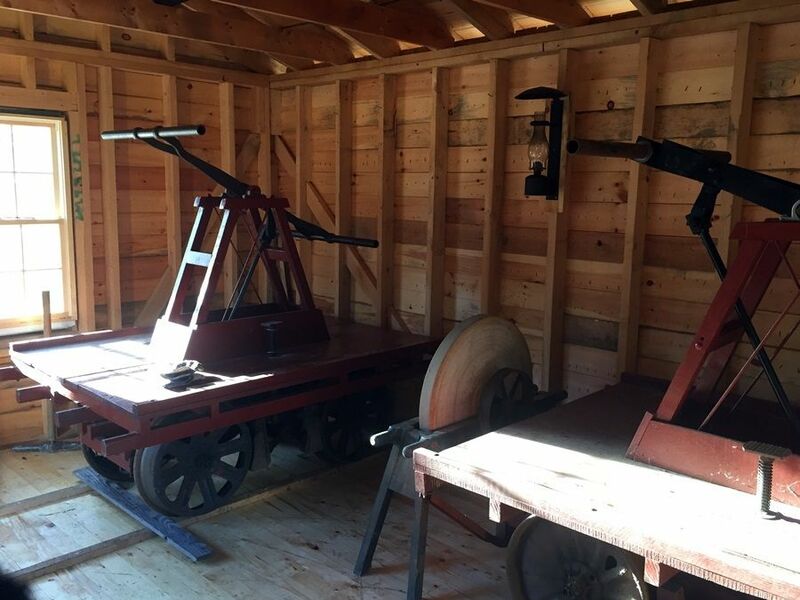 -Golden Spike NHS: Central Pacific Jupiter finally is getting the flat spot on the front pilot truck wheelset fixed, which according to the rangers means that 2015 will be the first year that she will participate in the Winter Steam Festival in a long time. -D&RGW 223: the boiler was finally lifted from the frame; it will be removed next year when the snow melts. -Utah State Railroad Museum/Ogden Union Station: The Brothers Klarr and Chris Fussell of Dynarail restored the front ends of D&RGW 5371 and SP 8800 to their as-built appearances, right down to the class lights, gyralights, and mars lights. In western Wisconsin, the Colfax Railroad Museum had a successful restoration year. Our 1884 Omaha route mail car #301 now has all of its handrails and grabirons back and the ends of the roof rebuilt. Painting and lettering is about half completed. We started priming the Porter 2-6-2T and restored and rehung the smokebox door that had been shattered sometime in the past. The new air compressor we got with funds from the Tom Dailey Foundation will be used in the needle gun cleaning on the frame and valve gear. The 1898 depot now has a new roof, following the tornado that struck in June of 2014. It has been rewired on the second floor and the remainder of the first floor will be done this winter. 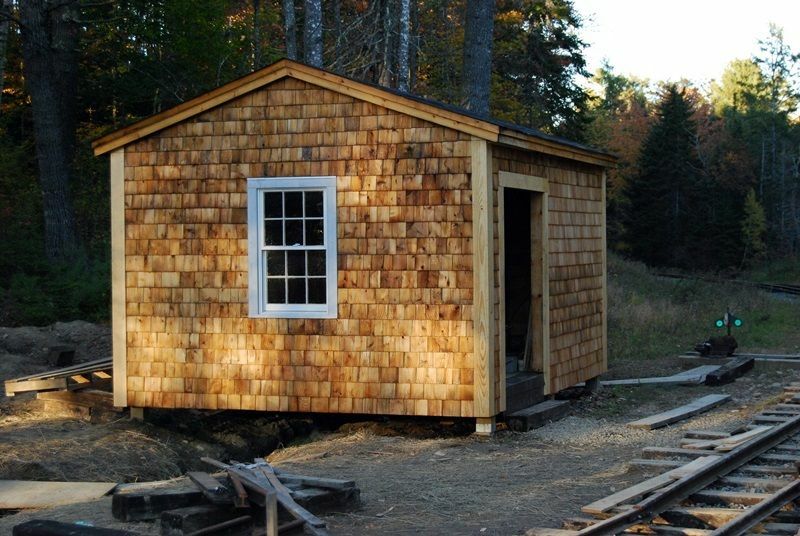 We also re-shingled the garage that was damaged in the storm. The DSS&A caboose had its siding replaced that was showing its age and the repainting will be finished in the spring. WW&FRy's new car barn. We still have to ballast the track in the barn and upper yard this spring. A replica of the Whitefield section house was also built this year. B&SR boxcar 67 making a slow trip from the car barn to the shop. On a smaller scale than other mentions in this thread, SP 10408 "Pride of Texas" Budd Coffee Shop - Lounge car from the 1950 Sunset Limited car order was rescued from the old Whistle Stop Ranch near Tyler Texas, where scrapping was imminent, and moved in Spring 2015 to 9300 Highway 290 West Austin Texas there joining 4 other Budd cars, including SP 5008 RPO car from same car order. Pride of Texas being restored to original interior appearance and colors, including longhorn heads and spurs over windows, and Texas ranch cattle brands on leather window pier panels and leather bar front. Undoing AMTRAK horrific 1970S disco purple and pink interior paint scheme. Kitchen was found to be completely intact, including big tall urn coffee pot. Car being restored for lease to a diner-type restaurant tenant. Exterior now fully polished and exterior paint finished, to 1950 SP standard, with consulting help from John Signor, Mr. Cauthen and others. Do not know how to post pictures on this board or would do so. See www.texascompound.com for a few images of all five cars now there. 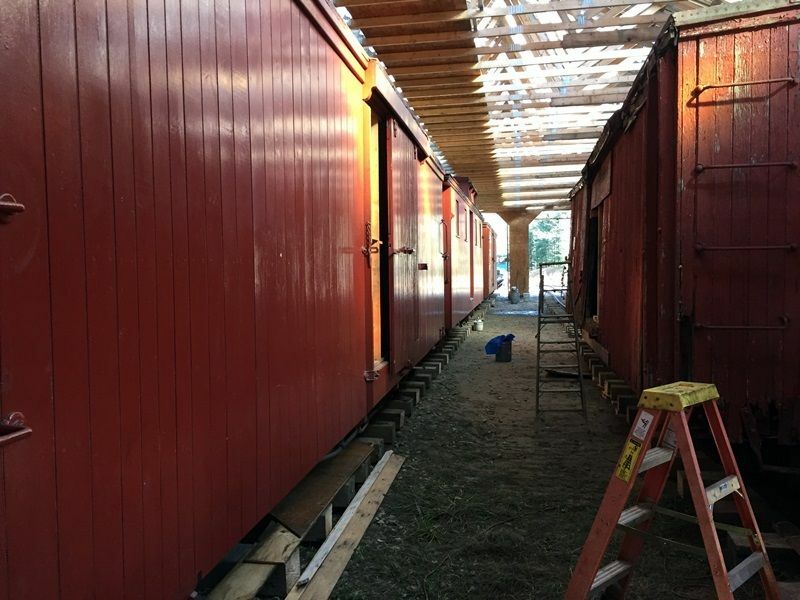 These cars being restored for use by commercial tenants, somewhat copying from a similar concept seen on vacation at depot at Calistoga Hot Springs, California a few years ago. Copies of the original Budd drawings are now becoming available from IRM and its people have been quite helpful in supplying blueprints for this project. Their preservation and catalog effort is of immense value to the restoration efforts of Budd car owners, and the folks at IRM deserve large credit for undertaking that task, which is daunting. I am told they received 57 pallets of drawings and blueprints about this time last year, and have been working all of this year to get them shelved in secure dry storage, so as to be archivally safe, and easily accessible. Kudos to Thyssen-Krupp/Bombardier for allowing the release of the drawings, finally. I give special thanks to IRM archivist Ted Anderson, who has been of particular assistance, in a meticulous way, with my drawing requests. Their acquisition and preservation of the Budd construction drawing collection is a massive achievement for the preservation field. I hope that future plans for the drawing storage building include the installation of a fire sprinkler system, because the collection is of priceless value. Californian Jon Clark handled the acquisition for me of almost all of these cars, along with the ATSF 1371 "Nambe" bar lounge car which has been restored and leased to the Austin Steam Train Association for service in their excursion trains. 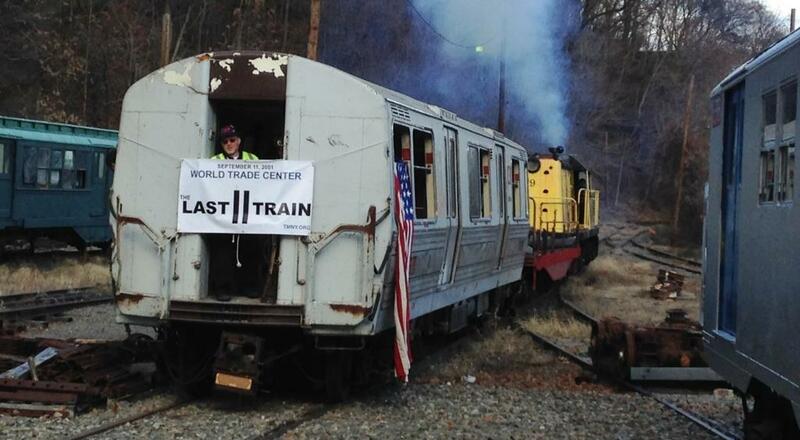 Today was an important day at the Trolley Museum of New York when its new acquisition arrived, PATH PA1 car 143. This car is one of two that survived in the ruins of the World Trade Center and will become the centerpiece of a new 9/11 exhibit that will include other artifacts of that fateful day. Secondarily, Locomotive No. 9, a WWII vintage Whitcomb 65-tonner, was made ready to move 143 into the yard. 9 hadn't moved in nearly ten years and required numerous electrical and mechanical repairs performed over several marathon days by a small group of volunteers. -Roberval & Saguenay #20 (MLW RS2 built in 1949) was returned to service after a 22 year absence from active service. I took almost four months of non-stop efforts to repair and restart this historic piece and she was one of the stars of our diesel weekend. -AMT #1311 (GP9u) and AMT #603 (HEP generator cars). Both got a generous amount of work to make them serviceable for the diesel weekend and they both performed on the museum's version of an AMT commuter run, during the diesel weekend. It was the first run of an all HEP equipment at the museum also. -CP #4237 (C424) and CP #4563 (M630) also received various repairs (big and small) and were also restarted for our diesel weekend. They also performed in our night photo session. -MTC #W-2 (electric work crane) was a work horse at the museum for many years. Out of service for about five years, in 2015 it got major cab roof repairs, replacement of all of the trolley base boards, some rewiring and replacement of a number of air piping. It also got a replacement of all of its lifting cables and a good once over by a local crane contractor who was quite marveled by the age and the technology of this machine. It is now back in service. -In process right now is the complete rebuilding of the access from the streetcar loop to the shop. This involves the complete replacement of the existing streetcar girder rail switch with a three switch set salvaged from a former MTC carbarn and girder rail salvaged from various locations around Montreal. Lots of custom fitting for this project. Project is scheduled to be completed in 2016. The Bluegrass Railroad Museum repainted its second former DL&W commuter coach into our blue scheme. This completes our Open Window Coaches as a matched set (two former CNJ cars as primary, and the two former DL&W cars as secondary). We also have two Air Conditioned cars, a 44 seat former C&NW car, and a 56 seat former SAL car. We also repainted our L&N steel bay window caboose, still in the gray diesel scheme. David Kloke and gang visited with the Leviathan and the Lincoln Funeral Car, teaching history to central Kentucky, and helping us sell some tickets! That single weekend event went smoothly. While we had nearly 12000 passengers this year (a record for us! ), repair work took the rest of our income. 21 sticks of rail and 125 ties installed in our sharpest curve, with 75 more ties installed elsewhere. We also had to get our ditches cleaned, as severe storms in mid Spring clogged them right up, and risked washing away the track. Then, with money allocated already, we'll start the new year with selected bridge timbers being replaced. Former ICG GP8 7738 was boosted into better condition, with replacement batteries, and new fuel injectors. But with all the contracted work, we've still paid down debt, and next year looks brighter yet! Projects which are in progress are to install a former Southern Railway double track signal bridge (footers are in place, just need to fill in the holes, and erect the bridge!). Repainting of our Southern Railway bay window caboose has also been begun. We're also considering several large scale projects, which will take several years to accomplish. 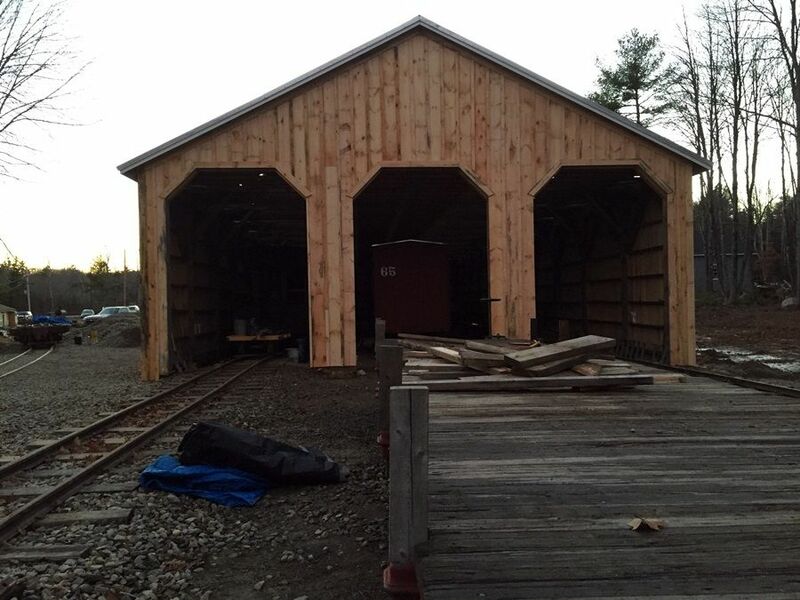 Valley Railroad (dba Essex Steam Train & Riverboat) has made progress in 2015. No.40 received it's 2nd 1472 Service Day Inspection. 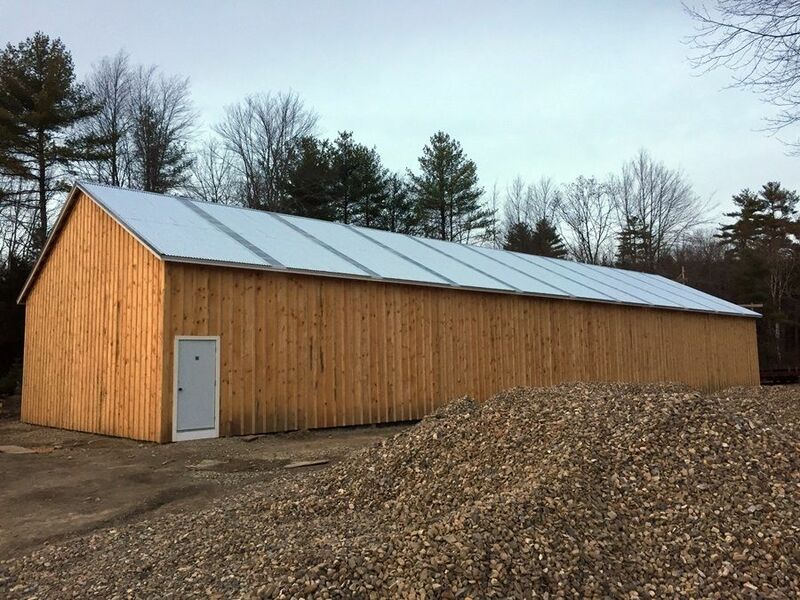 Our shop crew began the work in January, worked on it fairly steadily for a couple of months then had to attend to a few other items (see below) but got back at it in later summer and finished in October. The work was "fractionalized" with the locomotive's wheels being turned, spring and brake rigging repaired in 2013. Betterments made this year included babbitting the siderod bearings, renewing the main rod bearings (big and small ends) and converting all of them to oil lubrication ("jump pin" type) from hard grease. Bearing temperatures now run about 15 degrees above ambient. "Riverview", our open car had all of it's seats and window sills sanded and recoated. The interior walls were replaced below the windows. The floor was coated with pickup truck bed liner material (by a contractor) as an experiment (expensive) to keep the floor from deteriorating. About 30 feet of the lower side of the car was removed and replaced (big round head screws replacing rivets). Also, the cars friction bearing wheelsets were replaced with roller bearings. This bring to 6 the number of cars converted over the past couple of years. "Goodspeed" (see rypn "VRRX 400" thread for history), arrived in May and was immediately gutted back to the kitchen. Sections of walls were removed and four more windows cut into the sides of the carbody. A fair amount of interior work was needed to "blend" the new wall and ceiling sections with the existing. A new handicapped accessable toilet (not ADA, not quite enough room for that) was built. A contractor installed a new hot water, baseboard heating system. Rewiring was also done by a contractor. The interior was repainted and 40 lounge car type chairs installed (and filled throughout the season). We are well on our way to a 2 year payback on this project. Four former CPR open window coaches were purchased (VRRX 7401-7404). Three of these ought to be in transit before the end of the week. The other needs an elliptical spring, which we have on hand but has yet to be installed. Over 35 operating days, with two steam hauled train sets, we entertained over 68,000 riders on our "North Pole Express" and "Santa Special" trains. Baltimore Traction 554 returned to operation after extensive structural rebuild. Last edited by Dave Wilson on Sat Jan 02, 2016 11:24 pm, edited 6 times in total.